Here is a simple example of comparing different numerical methods for ODEs. We focus on the example subject to the initial condition . We know that the exact solution is . Let’s compare Euler’s method, the trapezoid method, and the Runge-Kutta algorithm with a step size of , evolving up to time . Comparing numerical methods. 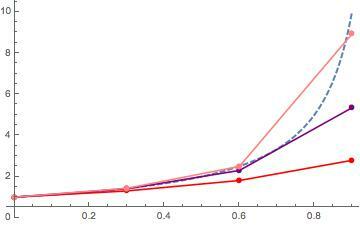 Dashed line is exact solution; pink is Runge-Kutta algorithm, purple is trapezoid method, red is Euler’s method. This entry was posted in Differential equations, Mathematica. Bookmark the permalink.